Oh sure...."if your sister wants citizenship...take care of it together..." oh sure... but do YOU tell me this? noooooo... you just dont' want me living in the same country as you. that's ok. i'm living in Switz. the cheese is way better there and so is the language! LOL! so i have my birth certificate (2 copies now)...what do i do? Make sure your birth cert is apostilled (can send address where to do that). After that just wait until mine comes through and see if is is successful and what paperwork you can reuse. 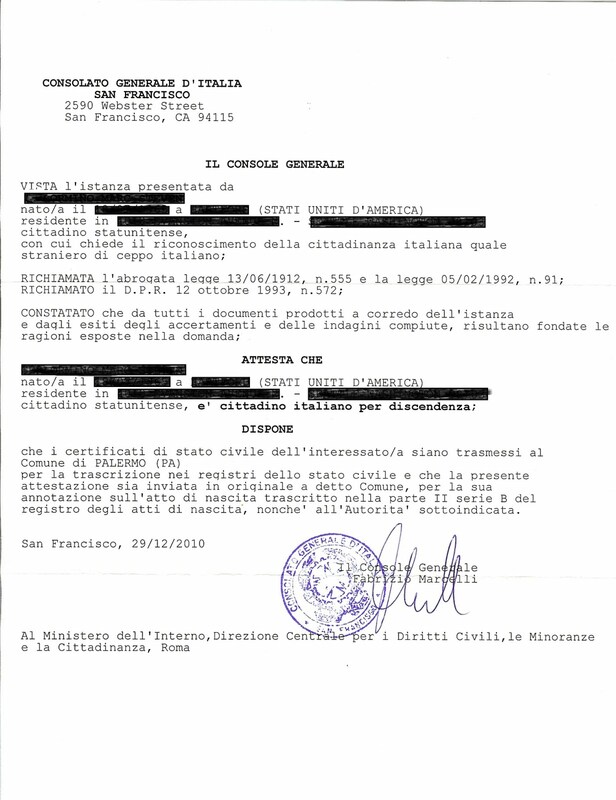 After years of constant research I can finally say that my husband has officially become an Italian citizen, now I need to wait 6 months for our marriage to be recorded in Rome in order to apply. Our little girl however can be registered as an Italian citizen anytime now; she doesn't need to wait. 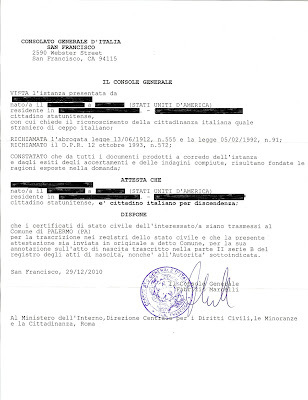 I must say that this quest started back in March 2005 when I first requested the birth certificates and marriage certificate from Italy and it wasn't until March 2010 that we submitted our application in the Italian Consulate of Philadelphia and at the end of November 2010 my husband received his official letter. That's awesome! Congrats. I've been meaning to update this post with our new info, but have been waiting. In a nutshell: 1/2 of Travelmarx is a citizen. 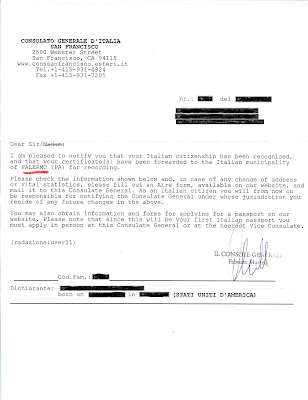 It took about 5 months from filing of the application to receiving the notification (June 2010). The other 1/2 of Travelmarx (the one writing) is sadly still waiting. When I inquired they said my case was "more complicated". Hmm, not sure what that means. I'm about to write again and try to ask for status. We just got back from 1 month in Italy and it was glorious. I wonder why they say your case is more complicated, the other 1/2 of travelmarx is your sibling if I understood correctly, so if he/she has the citizenship, how is it that you don't, unless you are dealing with a different consulate. Well, be patient, you'll get it soon enough. The other 1/2 of travelmarx is my partner, so different families. The only thing really different was a divorce in my family (my mother). Perhaps that takes more effort to verify. Who knows. Mine arrived last week! We both have citizenship in under 1 year. We are excited. Not sure of the next step. Probably to get passports. I just came across your blog while researching the SF consulate as I have my appointment next month to submit my application. May I ask if you needed to have the certificate of naturalization apostilled and translated? I keep reading conflicting information about this. Hi. Per the consulate’s instructions, only birth, marriage and divorce certificates require an apostille. So, no we did not have the certificate of naturalization apostilled or translated. Hopefully, it hasn't changed. They'll let you know otherwise. Good luck next month! I also live in Seattle and I have a few questions about the San Francisco consulate. Firstly, on their guide to jure sanguinis citizenship it says to ask them about special accommodations for people who live out of state... did you get any such accommodations? And secondly, in your post you mention if you and your sibling live in the same jurisdiction you can apply together - any idea if you can still do this if you live in different jurisdictions? (My brother lives in Boston.) Thanks! Re: accomodations, check out the consulate site for more info. If you are out of town, I think it means that you may be able to submit your application by mail. Here's a good link that answers many questions: GUIDE TO RECOGNITION OF ITALIAN CITIZENSHIP FOR PEOPLE OF ITALIAN DESCENT BORN IN THE USA, OR IN ANOTHER COUNTRY WHERE CITIZENSHIP IS ACQUIRED BY BIRTH (http://www.conssanfrancisco.esteri.it/NR/rdonlyres/31F414DC-2BAC-4781-B3CE-C2DFA0C0AF41/0/NEWCittadinanzaJuresanguinis_ENGLISH_2012.pdf). Re: Siblings (or other family members) in different jurisdictions piggybacking on your work. Just recently (see link above), applicants in different jursidictions must submit their own original papework, i.e., no sharing. Before the rule, there never was (from what we could tell) a process for sharing paperwork between jurisdictions. Is the Italian Citizenship law based on jus sanguinis? If you have an Italian ancestor in your family’s bloodline, you probably qualify for Italian Citizenship. 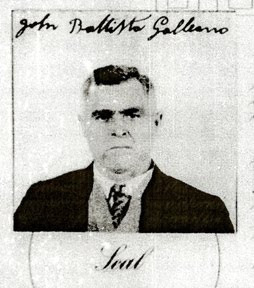 In fact, it is possible to claim Italian Citizenship if there is an ancestor in your family that was an Italian Citizen at the time of his death, meaning that he never renounced to Italian Citizenship in his life. To Miguel: Our path to Italian Citizenship was based on jus sanguinis. But there are other paths like marriage. To "Italian citizenship": If you have an Italian ancestor in your family bloodline it does not at all you mean you qualify for Italian Citizenship.. There are a number of conditions that need to be met. See the consulate's web page. I'm hearing mixed things about what is required at the San Francisco consulate. Their website says that only my personal documents need translation and apostille while someone I know who went through the process a while back via the SF consulate says that all documents from the United States need both. He also says (Again contradicting the consulate web page) that only translations from recognized translators will be accepted in SF. Any feedback from folks would be appreicated. For our applications, only our own birth certificates required translation, none of the other docs. Using an approved translator is smart. We worked with Gabriella Einaga (gabriella_einaga@att.net); she was fast, very reasonably priced, and easy to work with. How strict are the Consulates regarding Anglicanized names? For example, from what I can tell based on my records, my great grandmother was born in Italy and immigrated as Fiorigia, but almost all of the U.S. documents I've obtained list her as Florence. 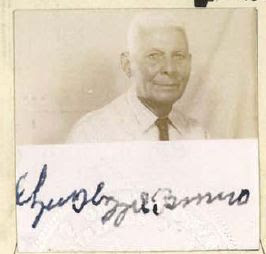 Similar situation for my grandfather, who was born as Armando but used Armand for his marriage certificate (which we also used on his death certificate). Another quick question - I've been able to find every document I need except my great grandmother's birth certificate from Italy. I'm not claiming citizenship directly through her (rather: great-grandfather [Italian] -> grand-father [American] -> mother -> me). Will that preclude me entirely from applying? She was born (we think) about a month before they left Italy, and we aren't sure the family actually registered the birth. PS: I'm applying either in Newark or New York. As long as you can present a list or an accounting of other names by which a person is referred to in the documents you present, you should be okay. For example, we created a spreadsheet of people and noted in it alternate name spellings and which documents those spellings occurred in. We had a few cases with ancestors with alternate spellings, as well. We think this shouldn't present a problem, but, work with the consulate and explain the situation. The San Francisco Consulate published a guide, which we found very useful.